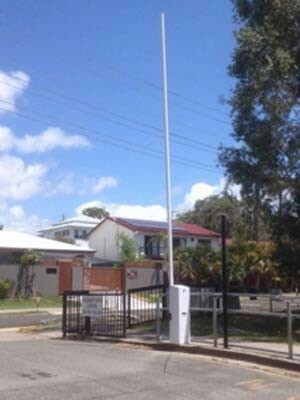 Fully automatic boom gates from Rotech Group Pty Ltd were installed at the Mooloolaba State School to control access into a restricted parking area within the school grounds. Road accidents are one of the highest causes of child deaths and injuries in Australia. While many of these accidents take place at home, the school has also been identified as a very vulnerable area. Most of these accidents are preventable if safety systems are in place. Traffic and parking problems in and around schools are putting children at risk of being injured or worse, particularly during drop off and pick up times. Being impulsive and easily distracted with little sense of danger, children place themselves at risk of injury. Given the many incidents of school car park pedestrian accidents across Australia, schools are now compelled to seek solutions to better manage the safety and well-being of pupils. Conscious of their obligations, schools place a high priority on implementing appropriate measures to prevent physical injury to children under their control. Safety had become a major issue at the Mooloolaba State School with parents ignoring the designated drop-off area and driving through the main gates to the teachers’ car park. Though a restricted zone designated ‘out of bounds’ for students and unauthorised vehicles, this car park could be accessed by anyone. For the welfare of their students, the school decided to strictly control access into the teachers’ car parking area during morning drop-off and afternoon pick-ups. Though the road entry to this car park was already gated, the gate needed to be left open during the day to allow convenient vehicle access. A boom gate was found to be the best solution for the application. The timer-controlled boom gate would close during drop-off times and reopen after school started. A keypad allows teachers, administration staff and authorised visitors access to the area during the period the boom gate is down. Being fully automatic, the system requires no supervision. Since there was no available mains power supply at the location, Rotech supplied their solar powered battery driven Sector 12vdc automatic boom gate, designed for high-volume traffic control environments and offering low voltage, high speed operation with a safety sensing feature. The solar boom gate also resolved the issue of mains power, eliminating the need to run high voltage cables to the gate, which resulted in significant savings on the installation.